This entry was posted on July 21, 2011 at 10:30 am	and is filed under Movement Forms of Nia, Nia. Tagged: Aikido, Carlos Rosas, Debbie Rosas, Duncan Dance, Energy types, Feldenkrais, Jazz Dance, modern dance, Nia, Nia energy, Nia Energy Type, Nia flow, Nia workout, nine basic Nia movement forms, personality questionnaires, personality types, Tae kwon do, Tai Chi, the Alexander Technique, The Nia Technique, Type A personality, Type B personality, win-win, Yoga. You can follow any responses to this entry through the RSS 2.0 feed. You can leave a response, or trackback from your own site. I call this book my bible. I refer to it often; I quote from it; I read parts of it at the end of class. 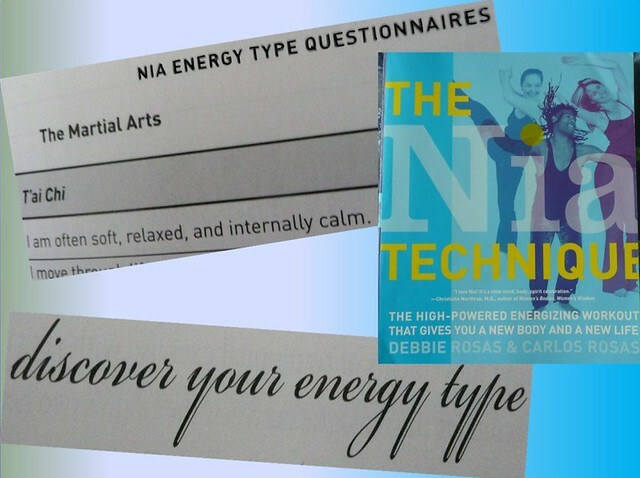 It is so very full of easy-to-understand, yet very specific, information about The Nia Technique. I am so blessed to be a Nia teacher. I was on a telecourse call when someone asked Debbie Rosas-Stewart if there was going to be an updated book done. Her reply was that the information is still pertinent. Nia has had some minor changes and updates, but the basics are still the same so The Nia Technique book will be good as long as Nia is around. Thank you so much for being here. I appreciate it. XOXOXOXO! Sounds interesting…a few of those statements apply somewhat to me! Well, a lot of the statements would probably apply to you if you were to do all of the questionairres. It is not a bad thing to have any of those statements be true or false. It is best to have balance. So if you were to go through each one you would just see where your energy mostly lies and you would have the option of doing things to balance out the energies. It is very interesting.